A lift kit is a great modification for anyone wanting their truck to stand out from the crowd. Choosing the right height for your Sierra can provide a more versatile driving experience while also highlighting other visual upgrades added to your truck. You just picked up a GMC Sierra 1500, and the truck is beautiful. It has all the power in the world, rides like a dream, and has all the features you heart could desire. The only problem is it sits a little too low for your taste. Maybe you want to have it sit a bit higher to fit some bigger tires in the wheel wells. Maybe you just want to level its stance a little. Perhaps you’re looking to get it up and as far away from the ground as humanly possible. Whatever the case, you’re going to need a lift kit to get up there, and we’re going to help you find the kit that’s best for you. Fitting larger tires is the whole idea behind most lift kits. This is where most of your ground clearance actually comes from; it’s a combination effort between the tires and lifts itself. Before getting started it’s important to note different lift kits allow for different tire sizes. Be sure to read the manufacturer’s specifications to ensure you pick the proper tire size. Directly from the factory, GMC Sierras suffer from a sagged front end. The front suspension is carrying a ton more weight than the rear, and because of this, it puts a pitch on the front of the truck. Most won’t notice this angle because it’s not that extreme, but it certainly is true that you cannot unsee it after it’s pointed out. If it’s something that really makes your skin itch you should consider grabbing a suspension leveling kit. This upgrade is fairly inexpensive and is incredibly easy to install. Once it is in place you will no longer have your GMC Sierra 1500 sitting like a hopped up El Camino. The design of GMC Sierras from 2007 and up uses spacers for the front end. This design brings the front end up while keeping the rear ride height intact leveling the truck’s stance. An added benefit to this kit is it does allow you to fit up to a 33-inch-tall tire in there. These bigger tires will make for better ground clearance, but won’t make for uncomfortable day to day use. 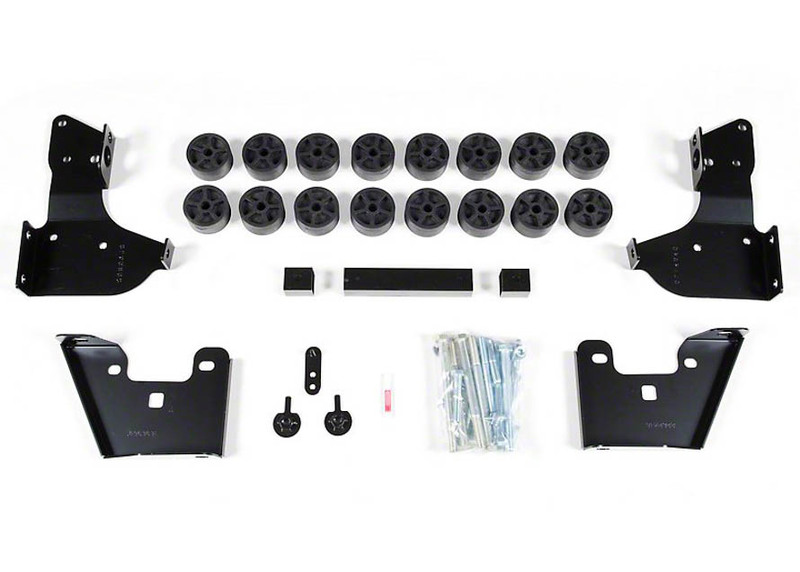 If you’re looking to bring the entire truck up, including the rear end, without getting too wild, a 1-2-inch lift is the kit you’re going to need. There are different kits available, and the way they achieve this added height can vary. 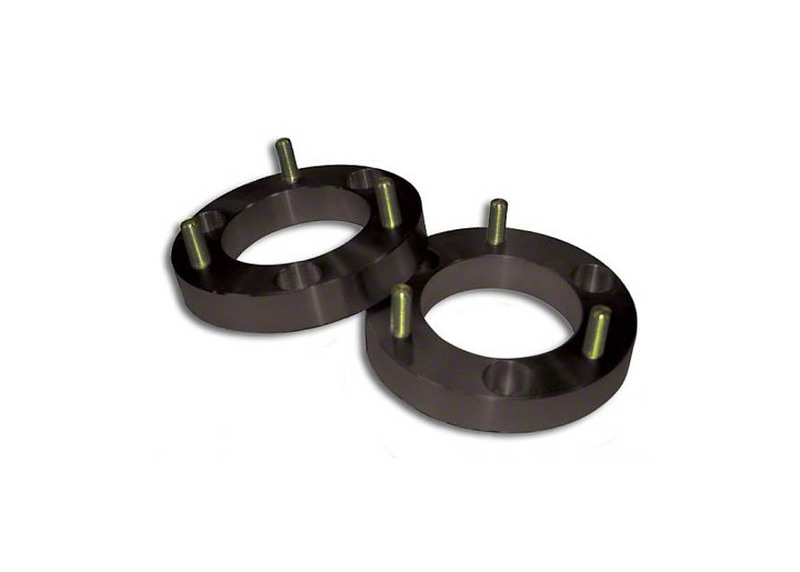 Spacer Kits: Spacer kits share a lot in common with leveling kits. Some kits that use spacers are even referred to as Level Lift kits. In the front, you will find a spacer just like you’d find in a leveling kit, but it will be paired with a rear spacer or block. Suspension Kits: Spacer kits are great and all but they do have areas where they lack. They add ride height and can fit the same sized tire a suspension lift in this range can (33 inch to be specific). However, their design simply adds a solid spacer to the suspension and doesn’t actually increase suspension travel in anyway. For day- to-day driving that’s great, but for off-road use it may seem a bit redundant. There are kits that use beefier shocks and springs to actually increase travel while raising the ride height. The shocks may also be taller than what is stock; they will need to travel further for proper function. The installation process is about the same in the amount of time and difficulty, but the price point is a bit higher. So maybe 33s won’t cut it. Maybe you need an even bigger tire. You’re thinking you’d like to squeeze a 35-inch tire in there. This tire size is big and it’s bad, but you’re going to need that much more suspension lift. Again, this can be done in a few ways. 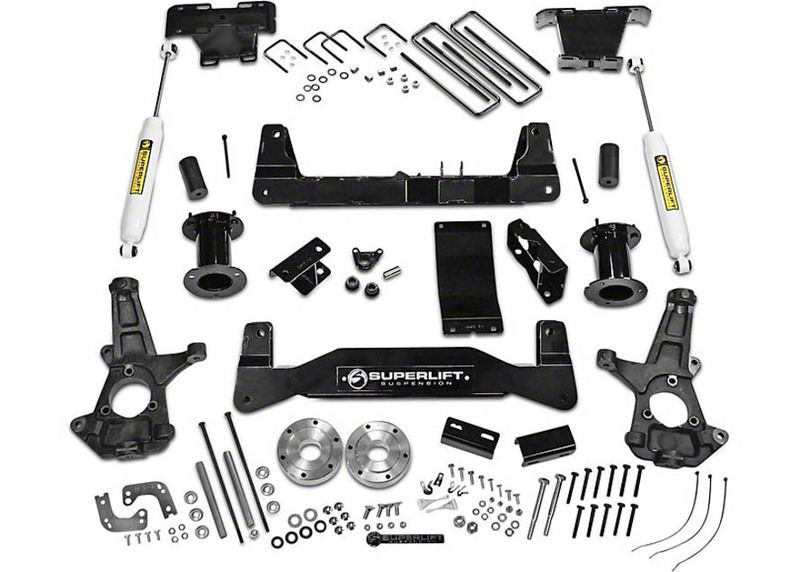 Suspension Lifts: The suspension lift is going to be a little more complex than the smaller kits. At this point steering components like your control arms and possibly the steering knuckles will need to be extended to accommodate the added height. Taller shocks will be needed for this type of kit as well. Professional help is a must here as this can get pretty in depth. Once this kit is in place you can ride in style with 35s and the confidence to take on any obstacle. 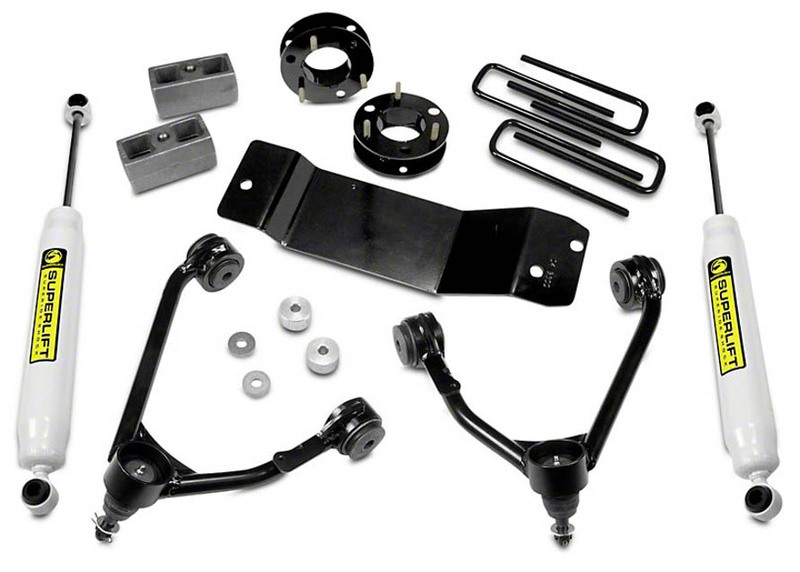 Body/Suspension Combo Lifts: This type of kit is more oriented toward fitting larger tires in the wheel well than it is about ground clearance. They do lift the suspension some to get the first bit of clearance. A body lift is then used to go the remaining distance. A body lift actually separates the body from the chassis which is how the wheel well continues to grow. These kits are perfect for owners who just want to fit a bigger tire in the wheel well without breaking the bank. Also, it’s worth noting these kits may not require taller shocks as the suspension is not actually seeing any significant changes. If you want to get as close to the sun as possible, you’re going to need the biggest possible lift kit you can get your hands on. Stretching up to 7 inches of lift will allow your Sierra to squeeze a 37-inch-tall tire underneath it. This type of kit does change your once average half ton into a towering behemoth roaring down the roadways for all to see from miles around. They also make for maximum ground clearance. This type of lift will require modification to the truck itself so you need to be aware of this before you get involved. The steering components and mechanical components such as steering knuckles and control arms will likely need to be extended and possibly even relocated to make sure they can function properly. Taller shocks all around are also a must. The good news is everything is included in the kit itself to make this happen. Once it’s in place you can rest assure you can overcome any obstacle both on and off-road. The only thing left is to pick out the proper shoes to fit this monster.